US Housing Bubble | Will Real Estate Crash In 2019? With home prices rising in most areas of the country for the past six to eight years, many people naturally worry about the next housing market downturn. Why? Well, many of these same people can vividly recall the turmoil they went through a decade ago when a large portion of the people in this country (and many other countries) lost their homes, jobs, savings and retirement accounts. While I think there are some who may be a little jealous that they missed their opportunity to buy low, I’m sure many people are simply cautious to jump in after all the destruction they witnessed after the last housing bubble. History tells us that current trends can't continue on forever, but is the only possible outcome another major economic collapse? In this article, I’ll explain why I believe the housing market won't experience a collapse in 2019. In comparing our current market with where we were at a decade ago, you'll see how significantly different the two are. So to make things a little easier to follow, I’ve broken down the reasons why today’s environment is different than a decade ago, but I’ve also included some of the similarities. You can judge for yourself whether or not we’re facing another catastrophic financial and real estate market downturn. Developers haven't overbuilt homes like they did a decade ago. Financing is much tougher to come by, with less risky loans being made. Less speculative financing & reliance on home price appreciation. Mortgage fraud cases nowhere near pre-crash levels. Mortgage delinquency rates on a steady decline. Refinancing real estate to live a lavish lifestyle is not as common. Homeowners with increasingly higher levels of equity. Home prices have increased at higher than normal rates (historically speaking). Booming economy, stock market and overall positive sentiment. Strong sellers market, buyers in a frenzy. Home affordability index: home prices have out-paced average wages. Google search volume for the term "housing bubble". 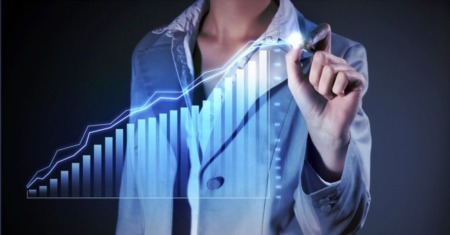 Real estate experts predict a major market shift. News outlets are already reporting the presence of a downturn. The definition and history of asset bubbles. After the last recession really set in, hardly anyone was looking to start a new development project. Not only were homes not selling, but lenders were not providing the financing most builders needed to get projects off the ground. Heck, many projects started during the boom were simply left unfinished and abandoned. 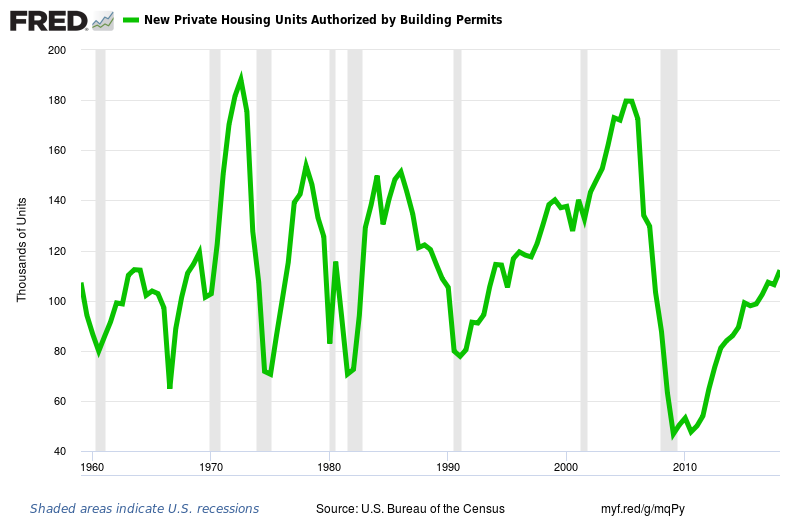 As you can see in the chart pictured below, nationwide residential building permits bottomed out from 2009-2011, hitting a 60 year low. Even though the number of building permits authorized has since more than doubled, we’re still hovering just above the historical average number of housing starts. The thing is, when new construction basically went to a standstill, it allowed the demand for housing to actually catch up to the inventory of homes that were available. After all, the US population is currently growing, and people need a place to live. Once the economy started to recover and the shortage of homes became readily apparent, builders realized there was a major need for new homes. The thing is, you can’t just start cranking out new homes overnight. The volume of new construction projects has increased over the past few years, but it still hasn’t reached levels that satisfy the overall need for housing. Here in Atlanta, we’ve seen double digit year-over-year growth in new construction listings, yet the overall inventory of homes for sale continues to decline. There’s still room for more new developments; unlike a decade ago when the market was over-saturated and supply greatly exceeded demand. Traditional loans have underwriting guidelines that must be met in order for a buyer to obtain a mortgage. These guidelines are in place to help ensure that the buyer has the capacity to repay the loan, but they also facilitate the sale of the loan in the secondary market. Makes sense, right? Unfortunately, in the early 2000’s, mortgage underwriting was like the Wild West. Underwriting guidelines were too lax and sometimes weren’t being properly followed; loans were just pushed through. In extreme cases, information was being fraudulently altered on mortgage applications to approve buyers for loans they couldn't otherwise qualify for (more on that to follow). These days, getting a traditional mortgage is no walk in the park. Lenders are asking borrowers for all their financial documentation… and scrutinizing it closely. They're even coming up with more advanced ways to evaluate borrowers' creditworthiness. It can be frustrating for even the most well qualified buyers! Despite the disdain from borrowers, I think we can all agree, it’s better than giving loans to people who can’t afford them. We know how that played out! In 2005, I had a college professor in one of my business courses brag to the class that he had just bought a 2nd home with a zero down payment interest only loan. He thought the concept was great, and even had his son to do the same thing. He was ready to buy as many as he could! His logic was that the return on investment when the property sells in just a few years, would be nearly unbeatable… especially at such attractive interest rates. Unfortunately for my professor and his son (along with millions of other people), this only works when home prices maintain a rapid level of appreciation. Once prices start to decline and/or mortgage rates reset to a higher rate, there’s little to no equity and the homeowner is stuck with a home where they can’t afford the mortgage payments and can’t even afford to sell. The good news is, interest only financing (along with other risky loan types, like adjustable rate mortgages), are pretty rare these days. Many people still anticipate the value of their home will increase in the future, but very few are banking on it to happen to avoid financial ruin. Mortgage fraud was a growing epidemic back in the early 2000’s. Leading up to the crash, cases of mortgage fraud grew by leaps and bounds. Some cases were downright fraudulent schemes hatched to steal hundreds of thousands of dollars, while others were simply a fudge of the numbers that enabled a well-meaning buyer to finance their dream home. These fraudulent transactions contributed to the expansion of the housing bubble and over-inflated prices in many areas. Even well-meaning buyers could find themselves overpaying for a home when comparable properties were sold at artificially high prices. These sales were also used by appraisers in their appraisal reports, and ultimately, the value of homes ballooned. 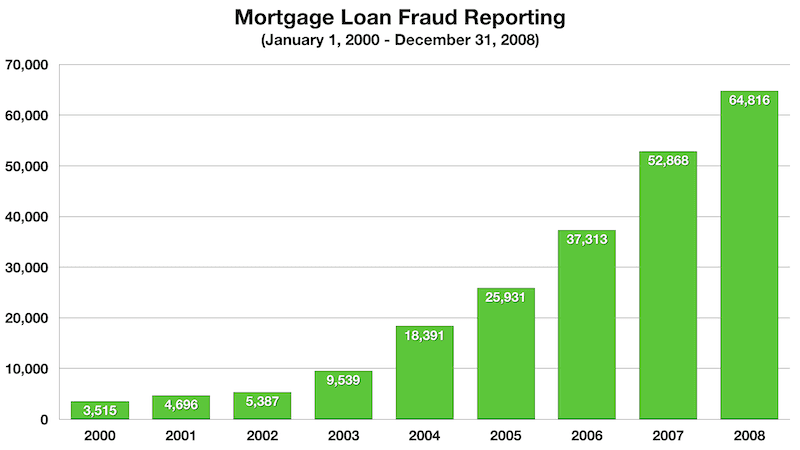 Judging by the numbers in the chart above, fraudulent transaction were skyrocketing prior leading up to 2008. Since the crash, mortgage fraud has not entirely gone away, but it’s definitely nowhere near peak levels. Lenders have put multiple measures into place to thwart these types of schemes and unscrupulious activities. The result is more arm's length transactions, fewer loan defaults, and increased market stability. However, technology seems to be facilitating new methods to carry out fraud by buyers needing a little extra bump to qualify for a loan. New services are sprouting up that allow potential borrowers to cheaply and easily produce falsified documentation required by the lender. Most of these fraudulent activities are probably used by well-meaning and generally qualified buyers; many who don’t realize the repercussions their actions could bring. Preceding the last housing crisis, mortgage delinquency rates began to climb sharply. This trend was highlighted in the 2015 film titled: The Big Short. In the movie, which is based on real life events, a small group of savvy Wall Street investors spot the trend you see in the chart below. Among other things, they analyzed the growing number of defaulting borrowers to predict a massive collapse of the US housing market (and subsequently, the world financial markets). 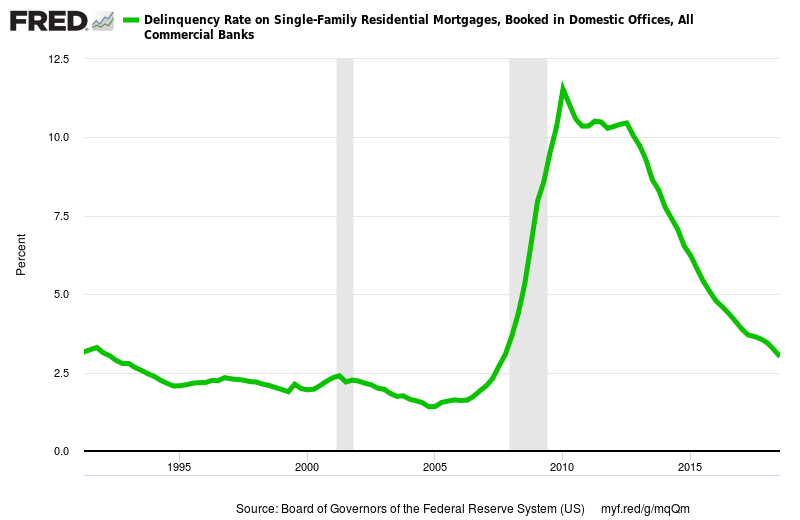 As you can see, single family residential mortgage delinquency rates skyrocketed throughout the recession as more and more borrowers were unable or unwilling to continue making their mortgage payments. This trend peaked in the first quarter of 2010 and remained at elevated levels until the third quarter of 2012. Starting in 2013, we’ve seen a steady decline in delinquency rates. If current trends persist, the prevalence of foreclosures and other distressed property situations will continue to diminish, further improving the overall health of our nation's housing market. Back in the early 2000’s, many homeowners treated their property more like a piggy bank than a store of wealth. With home prices skyrocketing and banks lending money to essentially anyone who applied for a loan (or refinancing), taking equity out of a home to finance a better lifestyle became wildly popular. Unfortunately, buying new cars & boats or taking lavish vacations simply added more debt that would one day need to be paid off. This doesn’t make financial sense, but at the time, it didn’t seem like a big deal. These days, refinancing a home to cash out equity has become much less common. In addition, banks typically limit the amount of money that can be pulled out. This is done to ensure that there is sufficient equity available in the event of loan default (the property is collateral for the loan). According to Freddic Mac, total home equity cashed out (prime conventional loans) peaked in 2006 when approximately $320 billion was taken out that year. For perspective, in recent years, the total dollar volume cashed out was $24.9B (2014), $43.0B (2015), $60.9B (2016), and $69.6B (2017). So far in 2018, total cashed out equity is estimated at 48.3B through the third quarter of 2018. It looks like total volume for the year will be slightly higher than what it was in 2017. Even so, this is merely a fraction of what it was leading up to the 2008 market crash. I’ll never forget driving through a neighborhood back in 2007 and seeing a sign advertising a home for sale and offering 100% financing with $10,000 cash back at closing. At the time, I didn’t know a lot about how the housing market worked (having just graduated from college), but based on what I had learned in my business classes, this kind of financing didn’t make sense to me from a sustainability standpoint. Ultimately, these loans gave the person borrowing money, very little incentive to pay it back if times got tough. In addition, the new homeowner would have negative equity in the property for years to come (if the value remained the same). This means everyone was banking on home values to increase indefinitely. If the majority of homeowners have little to no equity in a home, what keeps them from simply giving the home back to the bank when they can’t refinance, sell (without bringing money to the closing table), or struggle to make their monthly mortgage payments? The good news is, current trends show buyers have a much higher equity stake in the property than they did a more than a decade ago leading up to the housing market collapse. In fact, equity levels are on the rise and have reached 60%. I think it’s important to note that, in the fourth quarter of 2005, owners’ equity was just below 60% and began to fall sharply, fueled by over-leveraged borrowing. In the event of another recession, properties owned with more equity and less debt are unlikely to end up becoming the foreclosures and short sales that tanked the housing market the last time around. 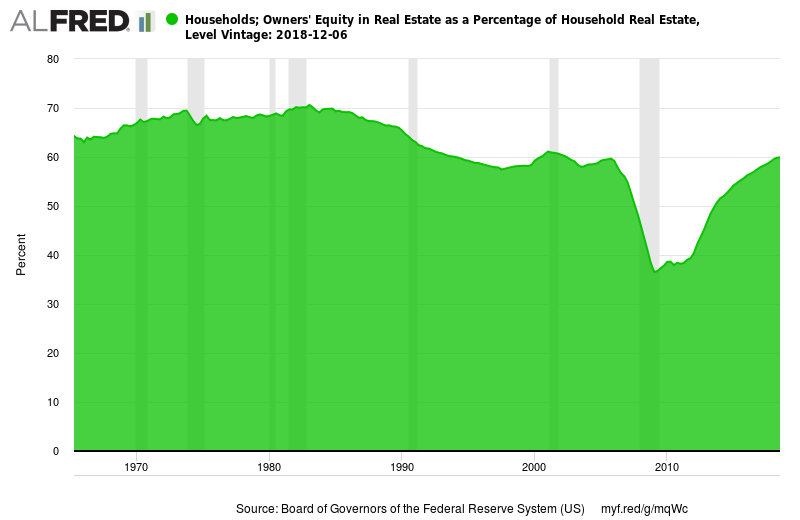 Hopefully we can get back to the days of 70+ percent homeowner equity like we had in periods of the 1970’s and 1980’s. Home Values Are Up - Are Prices Over Inflated? In my opinion, whether or not homes are overvalued depends on where you're located. Here in Metro Atlanta, I’d say home prices are actually where they should be, especially in relation to other large Metro areas. 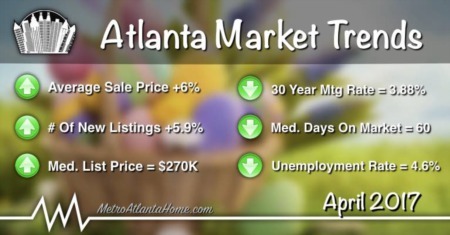 Real estate in most parts of Atlanta is still quite affordable when you factor in wages and other costs of living. In fact, we get multiple inquiries every day from people looking to relocate from the west coast, the northeast, and even areas of Florida. It might be interesting to note, these are the same locations where problems first started during the last housing crisis. This could be a sign that people see the writing on the wall and have already started selling off their high priced real estate in favor of more reasonably priced home in the Atlanta area. 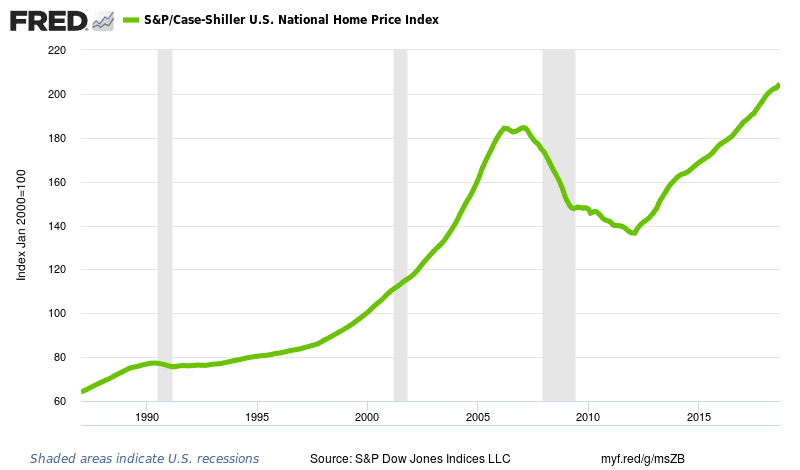 Probably the best way to visualize what home prices have done in the past few decades is to take a look at the nationwide home price index. This index tracks the price of homes as a percentage relative to their January 2000 value. As you can see, prices climbed sharply until Feb. 2006 and continued through Feb. 2007, at which time the index reached just over 180. This threshold was surpassed again in late 2016 and has since climbed to just over 200. This can be a concern because home prices have appreciated much quicker than wages (see home affordability index below). At some point, home prices reach levels where they are generally un-affordable for the average buyer, especially when combined with rising interest rates and stagnant income levels. When jobs are plentiful and the economy seems to be trending upward, people are generally ready, able and willing to make large purchases; such as real estate. For most Americans, this involves borrowing hundreds of thousands of dollars to be repaid over a 30 year period. Thirty years is a long time! Such a major commitment doesn't seem like a big deal when everything is going great from a financial standpoint. The fear of past financial hardships may start to fade away and seem like a distant memory. This optimistic mindset may be a major factor driving buyer demand, similar to what happened during the last housing boom in the early 2000’s. What if the stock market takes a hit and people lose 20, 30, or even 40 percent of their portfolio’s current value? What if economic policies result in corporate cuts and massive layoffs? What if interest rates skyrocket, sharply decreasing buying power? What if a credit crunch restricts the funds available for home loans? What if another asset bubble bursts, setting the stage for a recession? What if political tension leads to international conflict, or even another war? Wouldn’t any of these scenarios make a drastic and immediate impact on the overall economy, and ultimately take a toll on the housing market? While there wasn’t necessarily a shortage of homes a decade ago, the buyer mindset was still very similar. People wanted to get their hands on the hot properties, and they were going to do what it took to get theirs. Homes, condos, investment properties, you name it; just about anything a person could get a mortgage for would sell. Here recently, a shortage of available homes for sale has been the major driving factor of home price appreciation throughout the country, putting many buyers in a bind. The result? Brand new listings garnering multiple offers from desperate buyers, bidding home prices higher and higher. And for those who lose the bidding war? A feeling that they need to offer even more on the next home to ensure they get it! Despite the similarities, I believe the key difference is in the mindset of the buyer. 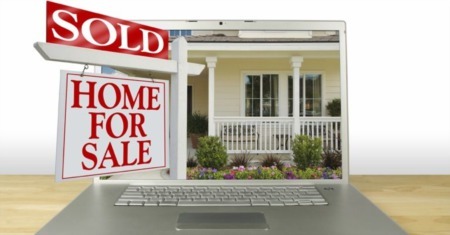 Currently, people seem to be buying for more traditional reasons, rather than speculation. For example: people receiving a job transfer, the need more/less space due to growing/shrinking households, be closer to family, retirement, etc. This means they’re primarily buying because they need a new place to live, not because they’re banking on the price to increase, like an investment. Therefore, this new generation of homeowners may be more willing and able to ride out any downswings the market may throw at them. On average, household income has maintained relatively consistent growth over the past 30 years, experiencing nowhere near the peaks and valleys of the stock market or the housing market. This makes the US housing affordability index a great measure of the health of our nation’s housing market and the ability for the average person to afford a home. According to the data, homes have gotten less affordable over the past five years as home prices have gone up at a higher rate than household incomes. Despite the drop, the index shows we are currently nowhere near the lows of 106.4 (1989), or 107.1 (2007), which were immediately followed by recessions. It’s important to note that, one of the key components of the home affordability index is the principal & interest payment calculation. Compared to the early 1990’s and 2000’s, interest rates have been extremely low since after the last crash. This has helped keep homes affordable, but most experts agree, interest rates shouldn’t remain this low forever. If interest rates were to jump up (everything else remains constant), home affordability would plummet because the calculation is strongly influenced by interest rates. I don’t know how much water this one holds, but Google search trends leading up to the 2007-2008 housing crisis may have forecasted what was to come. The chart below came from Google Trends and it shows search volume in the US for the term “housing bubble” dating back to January of 2004. According to Google’s data, starting in March 2005, people really started started searching this term. The peak interest was in August 2005, but people continued searching the phrase through August 2007, until search volume eventually dropped off. I think it’s interesting to note that, people began searching this term years before widespread problems with the housing market became apparent. Note: A higher value means a higher proportion of all queries, not a higher absolute query count. So a tiny state where 80% of the queries are for “housing bubble" will get twice the score of a larger state where only 40% of the queries are for "housing bubble". Depending on who you ask and when, you’ll probably get conflicting responses as to whether or not we’re in a housing bubble and if/when it could burst. I’ve been in meetings with some of the head brokers at Better Homes And Gardens Real Estate Metro Brokers who say we’re years away from any kind of slowdown. These are brokers who have experienced the ups and downs of the market and routinely evaluate local and national housing trends to keep a company of more than 2,000 agents ahead of the curve. As I’ve mentioned before, history tells us the market will likely turn at some point, but I don’t think we’re destined for the gloom and doom of what happened a decade ago. We’re overdue for a slowdown in price appreciation, and in my opinion, a return to a more balanced housing market will be better for us all in the long run. The News Says, The Market Is About To Crash! While some writers have evidence backing their reasoning for forecasting doom & gloom, others just want to be able to say they accurately predicted the market. Personally, I’m open to any argument that presents the facts and a legitimate opinion. What I don’t care for is fearmongering for the sake of garnering a few clicks and shares. However, there are those who closely follow the market in other parts of the country who are seeing things start to change. I recently read a great article by a writer who follows the housing market on the west coast. Since things often start in places like California and make their way to the country, their findings could be an early predictor of things to come in the next few years. Then you have the people/companies who have something to gain from even the fear of housing taking another tumble. They’re usually the ones putting out the outrageous articles with click-bait worthy titles. For this reason, the first thing I usually ask when reading one of these articles is; what is this person/company trying to sell me? Bubbles are nothing new, in fact, documented cases date as far back as the 1600’s. 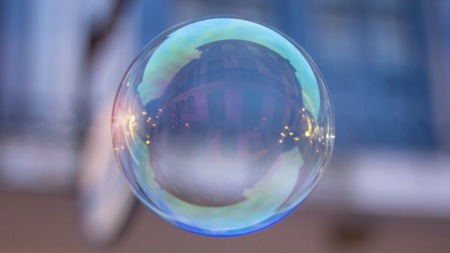 Some of the more infamous bubbles throughout history include: The Tulip bulb bubble the 1630’s, the South Sea Bubble in the 1700’s, the British "Railway Mania" bubble in the 1840’s, Japan’s real estate/economic bubble in the 1980’s, the “dot-com” bubble of the 1990’s, the US housing bubble in the early 2000’s, and most recently, the Cryptocurrency bubble (Bitcoin, etc.) in 2018. The key driving factors in each of these boom to bust scenarios is speculation and mania, but studying human social psychology has provided a handful of potential reasons people participate in such risky endeavors. More than just the fear of missing out (FOMO); bubbles cause otherwise rational people to make irrational investment decisions. Learn more more about the history and effects of bubbles at: https://en.wikipedia.org/wiki/Economic_bubble. At the end of the day, accurately predicting if and when a housing bubble will pop is slightly above my pay grade. Whether it’s a full-blown crash, a slowdown in price appreciation, or just a shift from a buyer’s to a seller’s market, most would agree something is inevitable. Regardless of the severity of the next pullback, you may want to plan ahead for a change in the housing market. If you’re a buyer, this may mean taking a long-term approach when purchasing a home… not just focusing on short-term appreciation. It’s usually not a good idea to overextend yourself, and now's probably not a great time to borrow more than you’re comfortable with, no matter how much the bank is willing to loan you. Playing the long game with your next home buying decision and living within your means could make all the difference if/when the market makes a turn. After all, you'll always need a roof over your head, so let us help you make the right decision on when and where to buy. Contact us today to get started.